BEIJING - China said on Thursday that it will not use rare earths as a diplomatic "bargaining tool", in response to challenges against its management of the vital metals. It also said measures to restrict the exploitation, production and export of rare earths are in line with World Trade Organization (WTO) rules. Zhu Hongren, spokesman for the Ministry of Industry and Information Technology, said at a press conference in Beijing that China will seek international cooperation to solve recent disputes over rare earths. "China will not use rare earths as an instrument for bargaining," said Zhu. "Instead, we hope to cooperate with other countries in the use of rare earths on the basis of win-win outcomes and jointly protect the non-renewable resource." China has cut export quotas for rare earths, vital for the production of a range of high-tech products, as reserves slumped, due in part to smuggling. Zhu said that China's restrictions on rare earth exports are for long-term development. Zhu made the remarks after US Secretary of State Hillary Clinton said on Wednesday that it would welcome any clarification of China's stance on rare earths and encourage countries affected to "seek additional supplies". 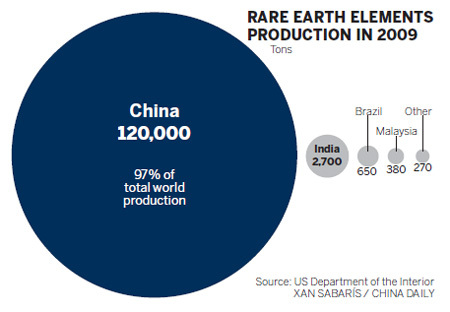 China has 36 percent of the world's rare earths but supplies about 97 percent of world demand, pointing to an obvious over-exploitation, analysts said. The Commerce Ministry said China's reserves of medium and heavy rare earths may only last 15 to 20 years at the current rate of production, which could lead to China being forced to import supplies. The Ministry of Foreign Affairs said on Tuesday that it is China's legitimate right to manage its own reserves.